Armenians love the rich, tangy taste of creamy yogurt. Add some mint, and it’s out of this world! 1. Cook barley according to package directions. Cool and set aside. **NOTE: Quick-cooking barley works well in this recipe. 2. In a mixing bowl, stir yogurt and salt until smooth. 3. Mix in the barley. 4. Add the cold water and mint; stir to combine. 5. Place in the refrigerator for an hour or two before serving. 6. 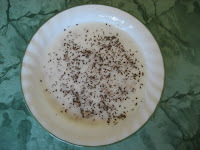 To serve: stir the yogurt soup, ladle into bowls, add an ice cube, garnish with a fresh sprig of mint. I am Greek but a browse through your blog and recipes is taking me back to my youth and the food my grandmothers would prepare. I love that these recipes are cross cultural and will definitely start to try making some of them. It is fantastic to find blogs such as yours! Thanks for sharing.